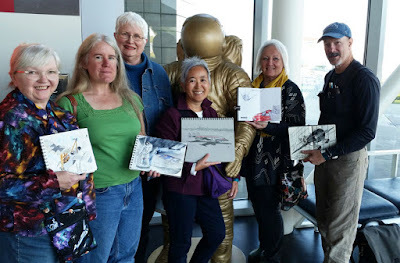 The day after Don Colley’s urban sketching workshop, he met Urban Sketchers Seattle at the Museum of Flight for more sketching. Other than at life drawing, I have never been much of a fan of toned paper. 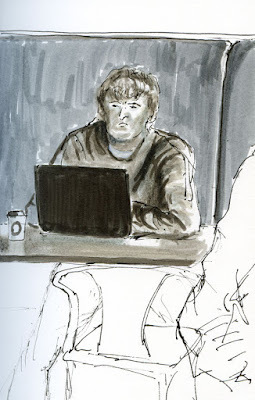 But I’d seen Don’s effective use of it, especially with his favorite gray Pitt brush markers, so I grabbed my Strathmore Toned Gray sketchbook to give it a try. Like the previous workshop day, Monday afternoon turned out bright and sunny. 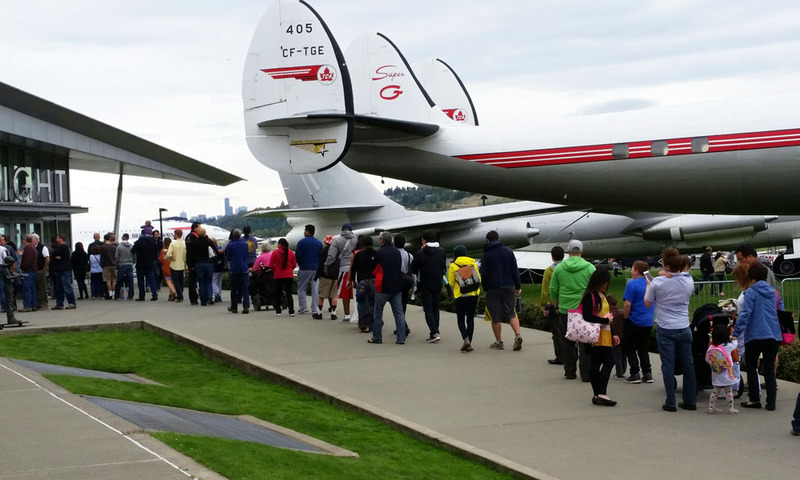 I climbed up to the museum’s “control tower” for a great view of the Lockheed Super G Constellation. It seemed almost a travesty to make a sketch including that gorgeous blue sky – on gray paper (although it would work well most of the year)! Next I wandered to a part of the museum I’d never seen before – the World War I gallery. Unfortunately, it was very dark, making it difficult to identify the values in the Italian fighter plane, the Caproni Ca 20, let alone shade them accurately. 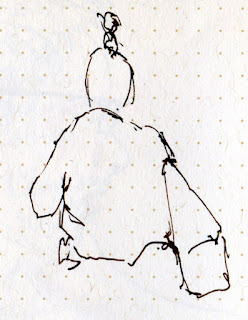 I had only about 20 minutes before the scheduled meet-up time to share sketchbooks. With that time constraint to keep me from getting bogged down with details, I chose a challenging but fun composition: a nearly nose-on view of the USAir 737 demonstrator. Its polished surface reflected the light in the Great Gallery’s all-glass walls in crazy ways! I have to say, I’m still not a fan of the Strathmore Toned Gray paper (which, admittedly, is made for pastels and graphite, not markers). 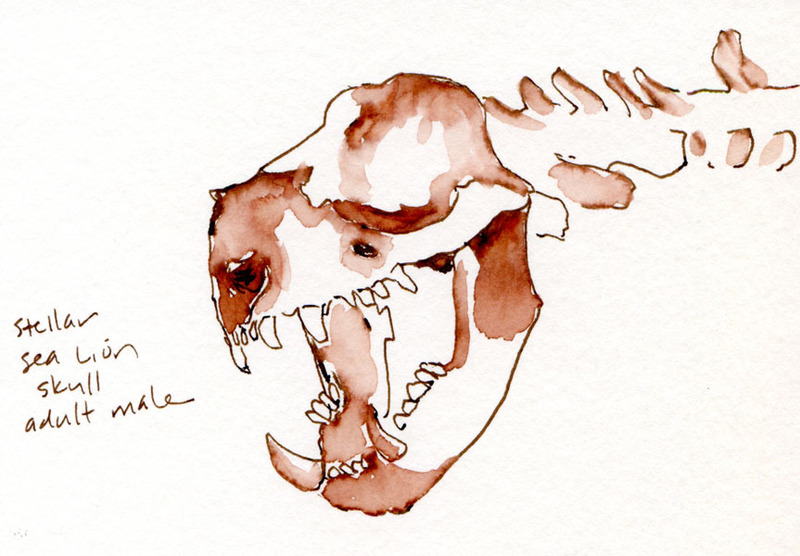 The marker ink seemed to sink into its surface, causing it to appear lighter once it dried. The smudging and blending trick did not work at all. I might try a tan paper next to see if I like a warmer tone better. 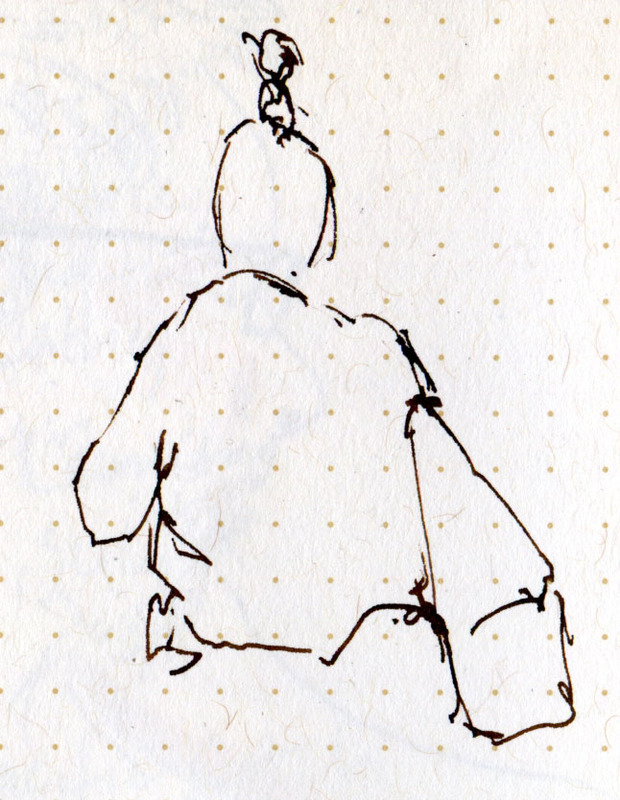 Still, with the markers in hand, I find I am observing values more carefully, and if that practice ultimately improves my sketches, I’m all for toned paper. 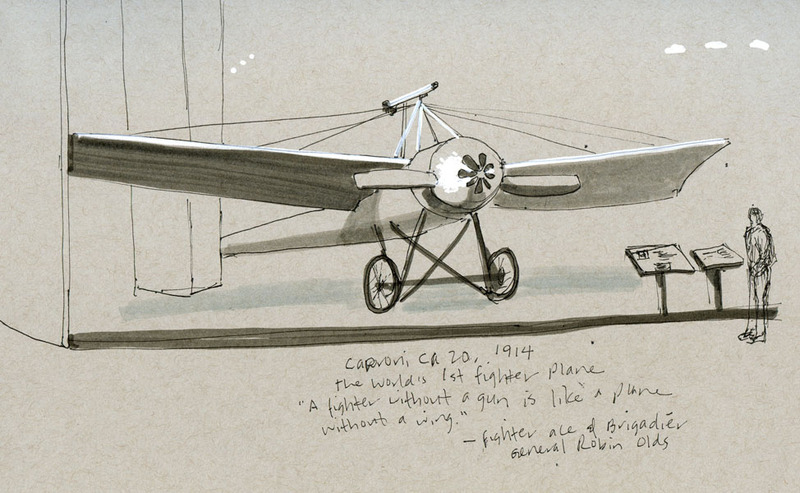 See Don’s Faber-Castell Road Trip blog for his sketches from the Museum of Flight. Don Colley teaching at the Daniel Smith store. About four years ago, only a couple months after I had started sketching, I went to a demo at Daniel Smith’s Seattle store by Don Colley. 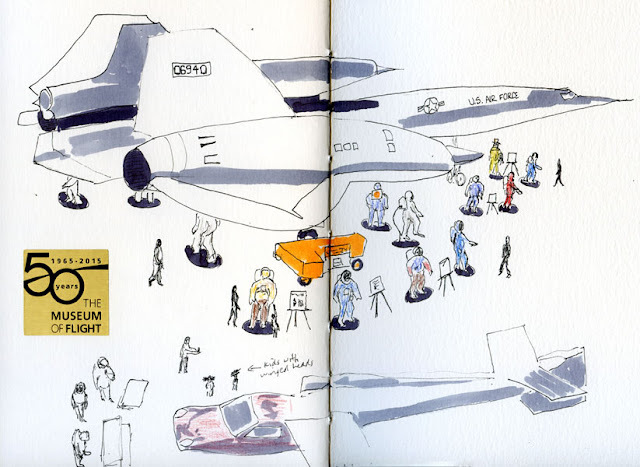 Although I had already been hooked on urban sketching by then (seeing images online had gotten me hooked long before I had actually put pen to paper), Don’s sketchbooks opened my eyes – wide. 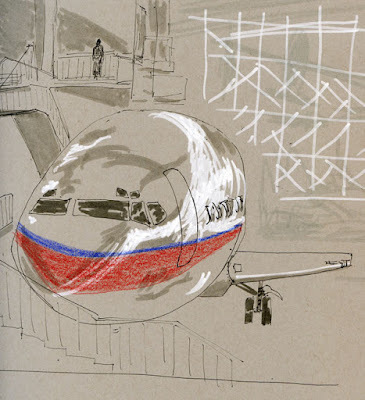 Up to that point, most of the sketches I’d seen online were of buildings and urban landscapes, and as much as they inspired and dazzled me, they also intimidated me. 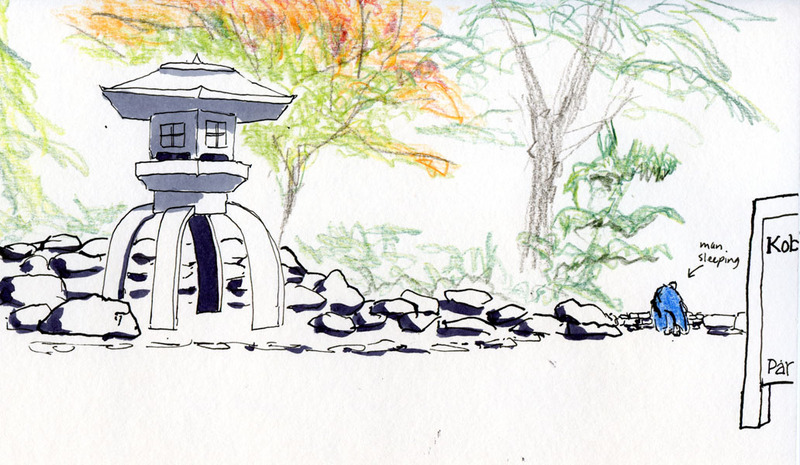 I wanted to sketch them, but I didn’t know how to approach all that architectural stuff. 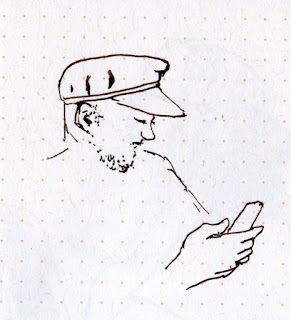 Then I discovered Don’s work – in addition to buildings and urban scenes, he makes breathtaking sketches of people sitting in cafes, sleeping on buses and doing other ordinary things – all the stuff that goes on inside those buildings. 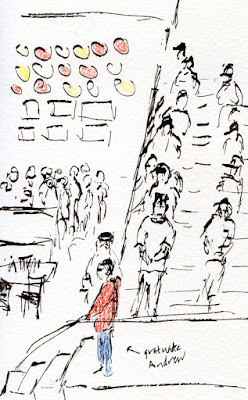 It made me realize that people and interiors were part of urban sketching, too, and that seemed much more approachable. 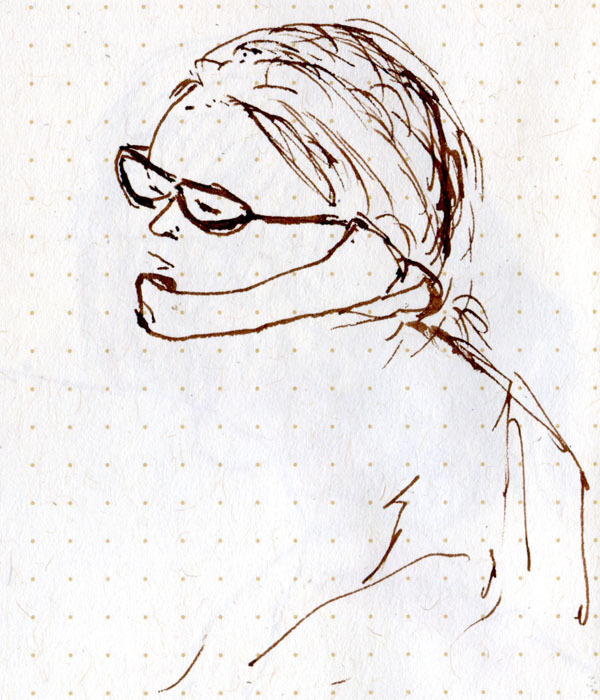 During his demo using Faber-Castell Pitt Artist Pens, Don let us skim through his piles of extraordinary sketchbooks, and one particular sketch stays with me even today – a woman reading in a coffee shop, head down over her book, the light illuminating her hair in a way that is nothing less than magical – sketched with dark blue markers. He did that with markers? Whew. 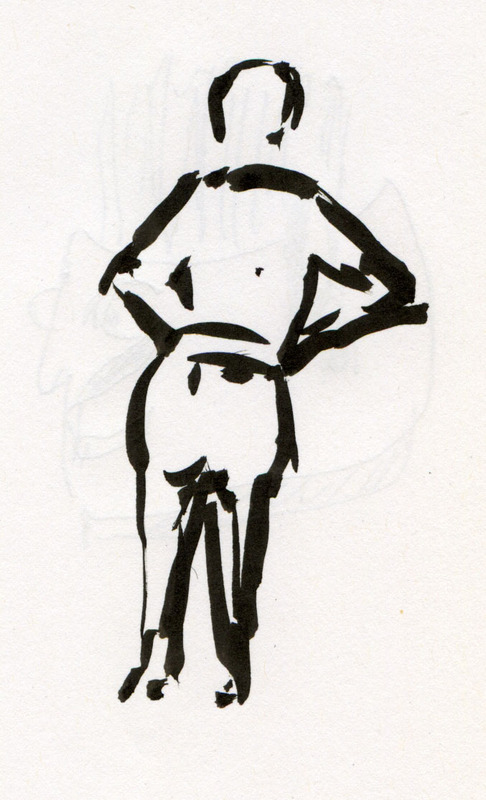 I’ve been following Don’s sketches ever since, continually marveling at his mastery of the human form – both captured in the urban landscape as well as in the life-drawing studio. Of course I bought a set of Pitt markers after that demo. 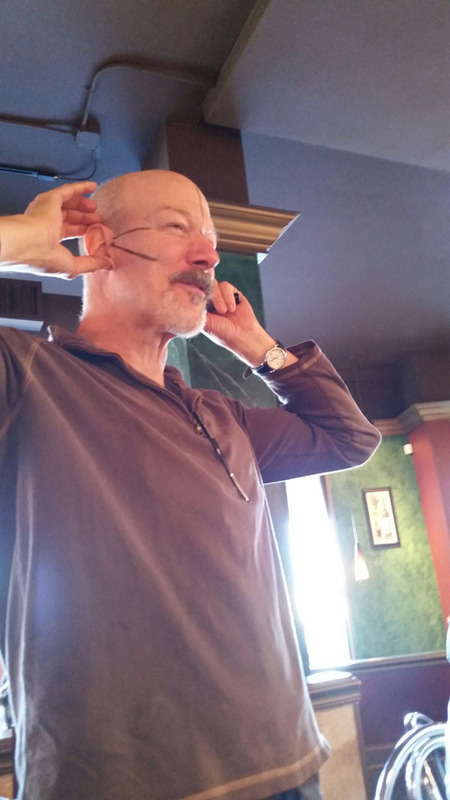 Unfortunately, my set was defective – it didn’t come with the super powers in Don’s pens, so I soon gave them up. 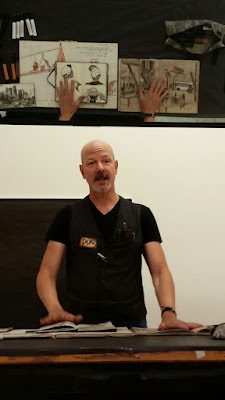 You can imagine how thrilled I was a few weeks ago when I heard that Don would be in Seattle to teach a workshop called “Travel Drawing - People and Figure”! At last I could learn the magic! Although the course description said that we could use any media we wanted, I decided it would be my opportunity to give those markers another try. 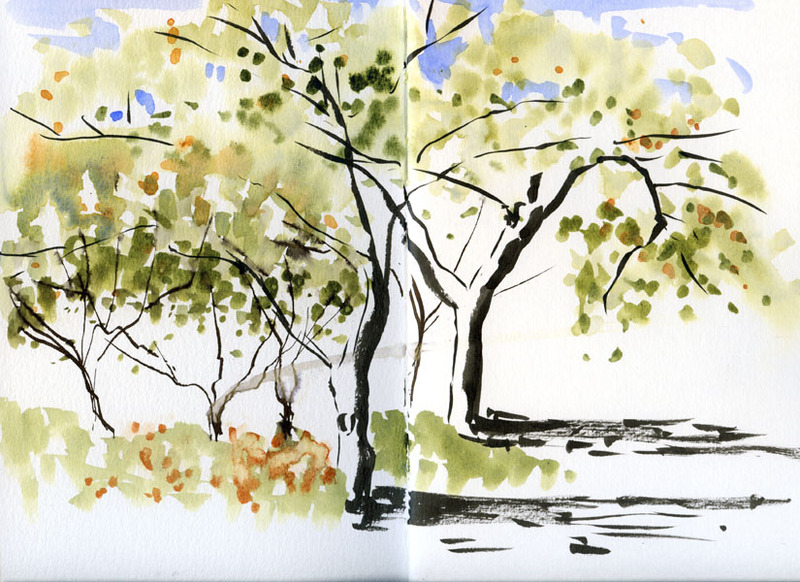 On a crispy-cold but beautiful Sunday morning, a bunch of eager sketchers arrived at Daniel Smith to learn Don’s ways. For the first hour, he described his approach to urban sketching and showed many examples from his sketchbooks. He always tries to catch the fleeting elements first – the person who is likely to walk off or other things that may change. Using a lightly toned marker, he quickly sets up his composition, including making small marks to place any figures who might imminently run from the scene. Then, using a range of cool and warm gray Pitt brush markers in a grisaille manner, he builds up the scene. 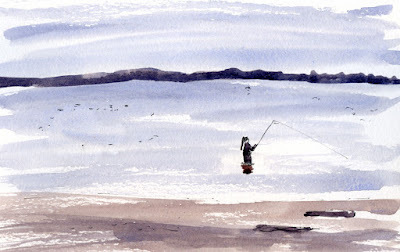 Strategically placing warm and cool tones enables him to differentiate between foreground, middle ground and distance. Using shading is the most common way to describe three dimensions in forms, but Don also likes to look for patterns to do the job. He showed examples of how sleeve stripes bending around a person’s arm or the upholstery pattern on a chair can give dimension to those forms. When I asked how he manages to avoid the streaky “marker-ish” look, he said he uses the markers’ tendency to make bands to help describe the texture and direction of a surface. We all watched with fascination as he extended the typical possibilities of markers by using his thumbs to smudge and blend the ink before it dries. He prefers sized paper “because the sizing retards absorption of ink, and if sized in the right manner, it prevents feathering and wicking so the drawn lines are crisper, and there is more fidelity to the marks.” He also applies the ink directly from the marker to the paper with his thumb, bypassing the marker tip altogether. And that ink all over his thumb? 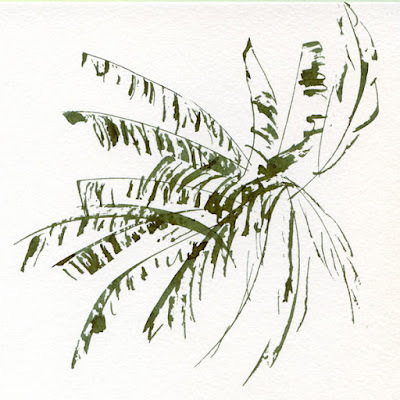 He uses that, too – like a stamp to add texture to fabrics and foliage! 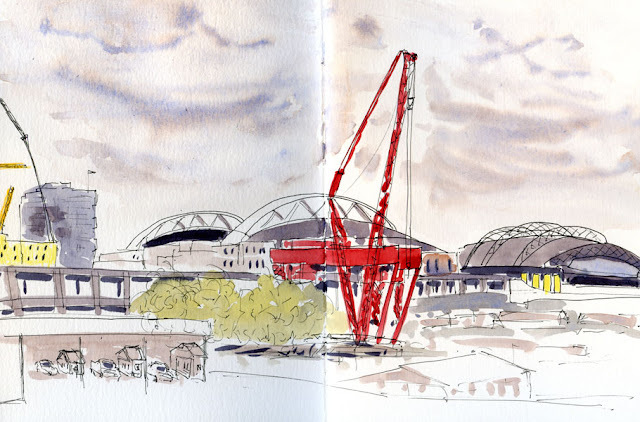 Don’s approach toward urban sketching is to create a “narrative” of the scene before him. “I’m not a camera; I’m an interpreter,” he said, encouraging us to be selective in choosing our composition. Don uses Pitt markers on more than paper! Dazzled by what we’d seen in an hour, we were hungry for more. 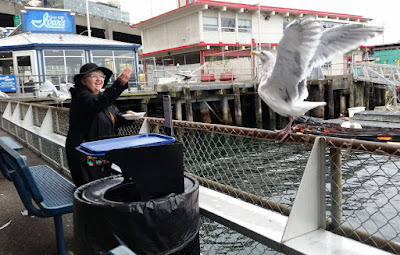 What surprised us, though, was that we would be moving from the cozy classroom to nearby Alki Beach for the rest of our workshop. Remember that crispy-cold weather I mentioned? Had I known, I would have worn more than two layers! Brrrr! Some hardy sketchers braved Alki’s biting wind, but not me – I ducked into a Vietnamese tea shop with Frances for my first workshop sketch. 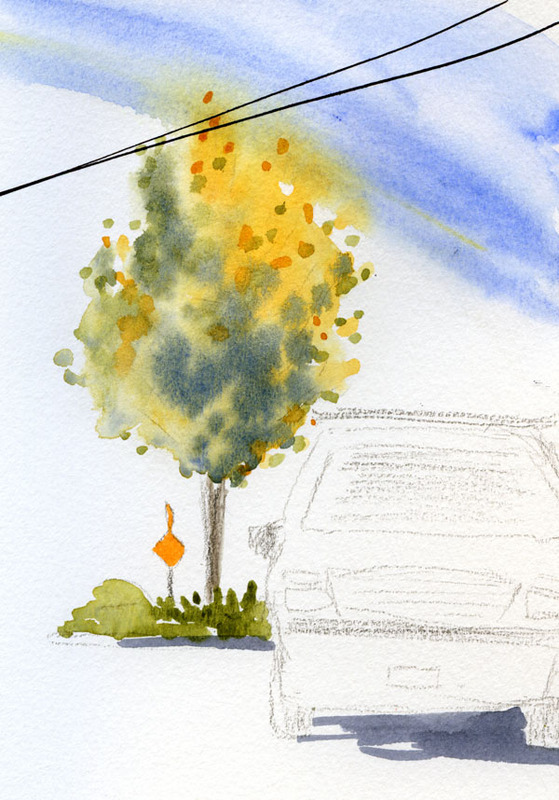 Through the window was one of my favorite scenes: a utility pole and lots of wires. As Don had suggested, I tried using the warm and cool marker tones to create a sense of distance. During lunch, while the rest of us scarfed down pizza, Don pulled out more sketchbooks to talk about concepts and techniques. The highlight of our lunchtime “lecture” was when he used a marker on his own face to show how to place features accurately on a head! As has been true in many a workshop, the key lesson in Don’s class was values, values, values. 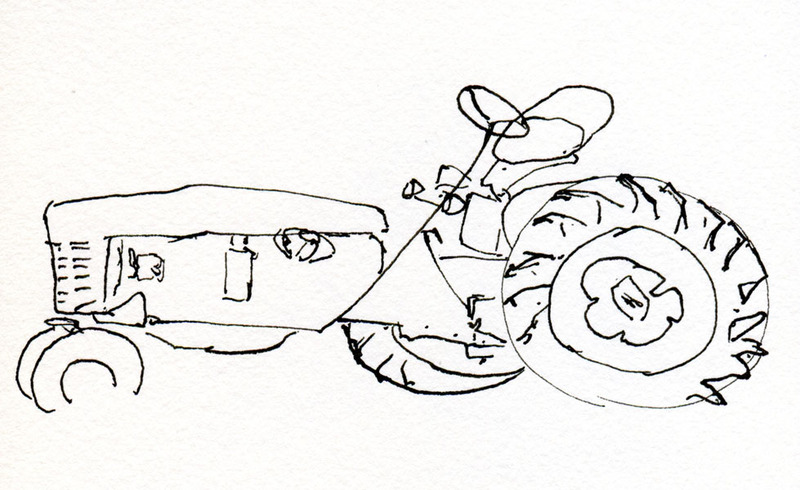 If you get them right, the whole sketch looks right. 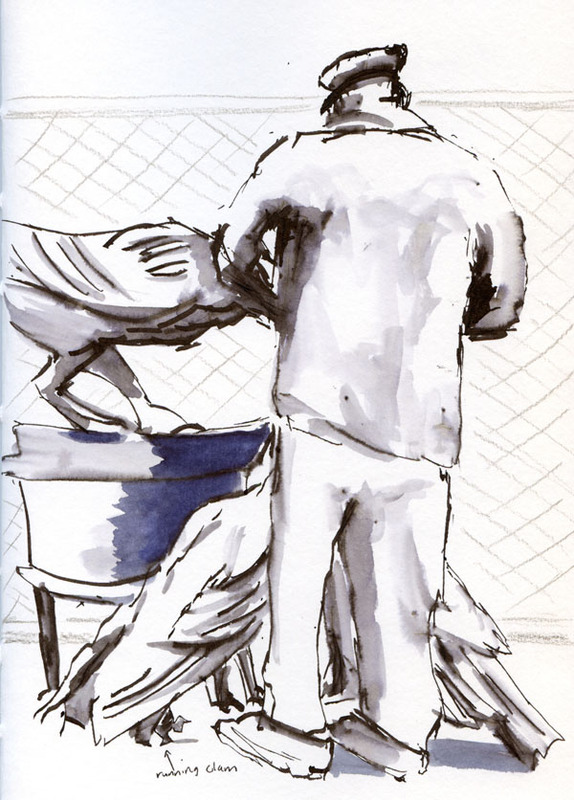 I don’t know if Pitt markers will become my medium of choice, but one thing is certain: Using a range of gray tones is one of the fastest ways to learn to “read” and understand values. 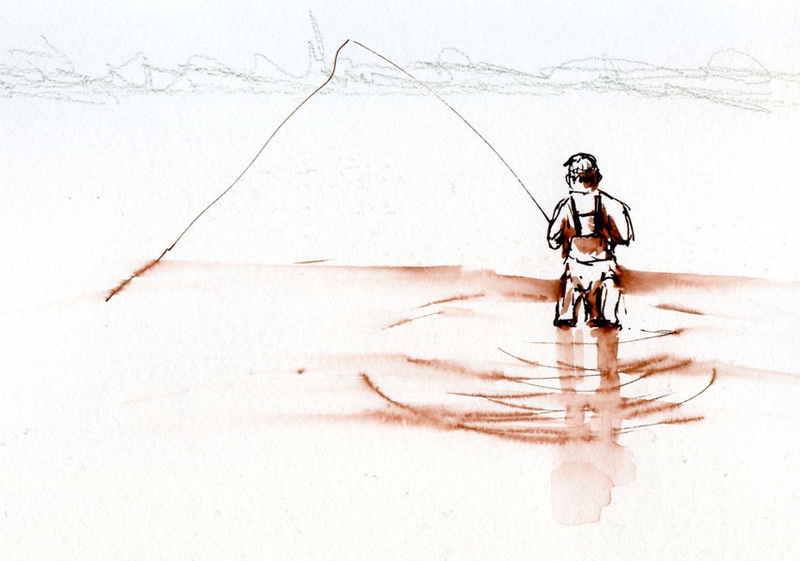 The second thing that’s certain is that there’s nothing magical about Pitt markers – it’s the man holding the markers that makes the magic. Stay tuned for tomorrow’s post when I show the sketches I made at the Museum of Flight – more value studies with Pitt markers. Check out the workshop swag from Faber-Castell! After a fun but tiring full day in Don Colley’s workshop (my report soon), I went up to Maple Leaf Park with Greg to see the total lunar eclipse. The eclipse started around 5 p.m. PDT, but moonrise was around 7 p.m., so by the time we could see it easily, it was near totality. 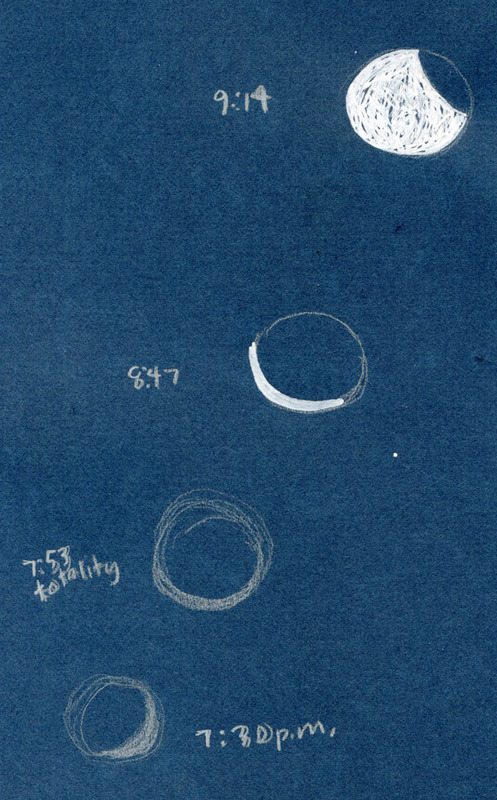 Although the sky was clear, there must have been a slight haze near the horizon, because the lighted part of the moon looked a bit blurry. I had big plans to use the sketching app on my tablet so I could sketch in the dark. 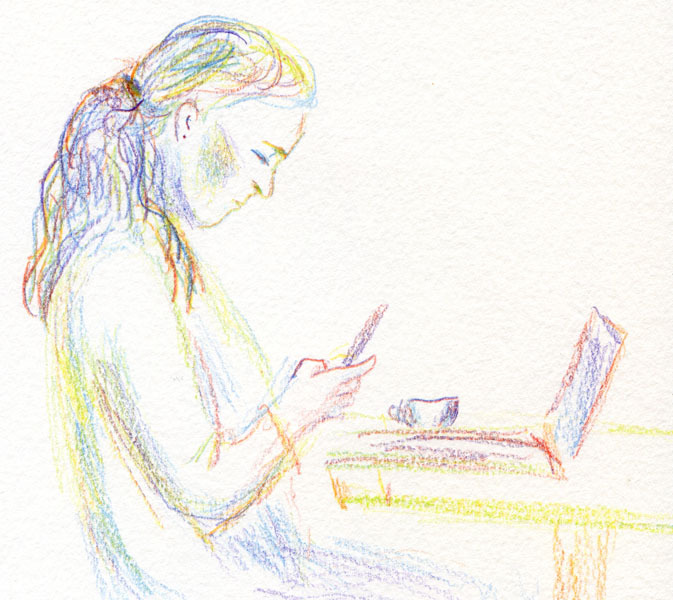 But I was so tired by then that it was easier to bring along a piece of tinted paper and a white pencil (lighted with my smartphone) then to figure out an app! We came back home for the second half of the eclipse, and by then the sky must have been clearer, because the illumination was crisp. I switched to my Molotow acrylic marker and a flashlight to make the last two sketches from our bedroom window. 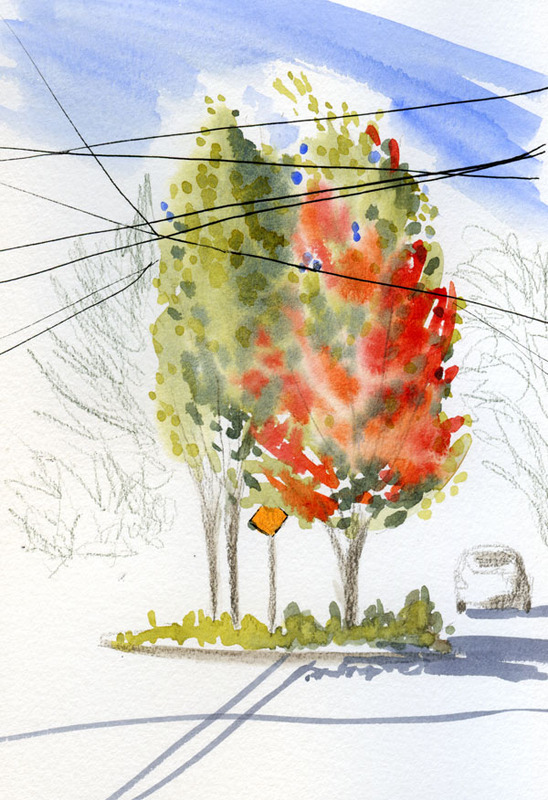 This maple in my neighborhood is a bit ambivalent about turning for fall. Unfortunately, it is losing leaves faster than its colors are turning. 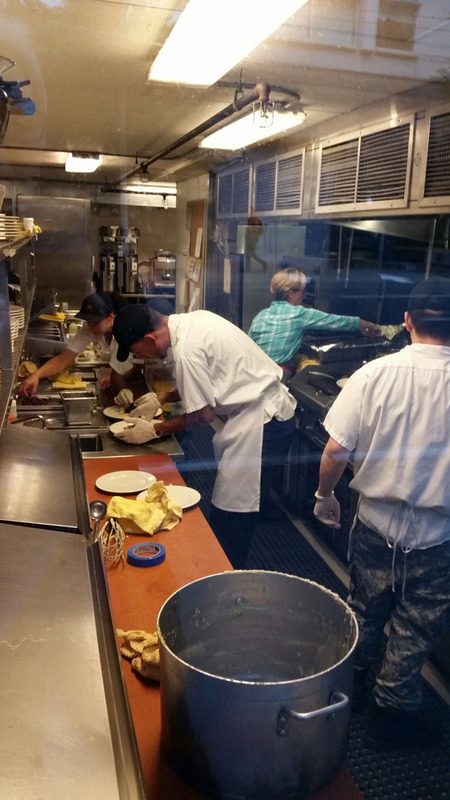 Seattle’s FareStart program has a worthwhile mission: Give life skills and training in the food service industry to homeless and other disadvantaged people so that they can get jobs and become self-sufficient. Although I’d known about the program for a long time and had heard that the meals they serve are delicious, I’d never eaten in the organization’s restaurant. Every Thursday night a local guest chef takes the lead in creating a menu that the FareStart students prepare. (They also serve lunch in the restaurant every weekday and prepare lots of meals for homeless people.) Last Thursday my friend Kathleen invited several friends to her birthday party at FareStart, so it was my opportunity to finally give the place a try. Chef Holly Smith of Café Juanita fed us a spectacular meal (heirloom tomato soup, polenta with chanterelles and green beans, and vanilla panna cotta for dessert! Most of the ingredients are donated by local farmers and businesses). As part of the evening, the current graduates of the 16-week program are honored in front of their peers, the volunteer staff and all of us diners. The graduation ceremony lasted all of about 10 minutes, so I didn’t have much time, but I wanted to sketch Andrew, one of the two students graduating that night. 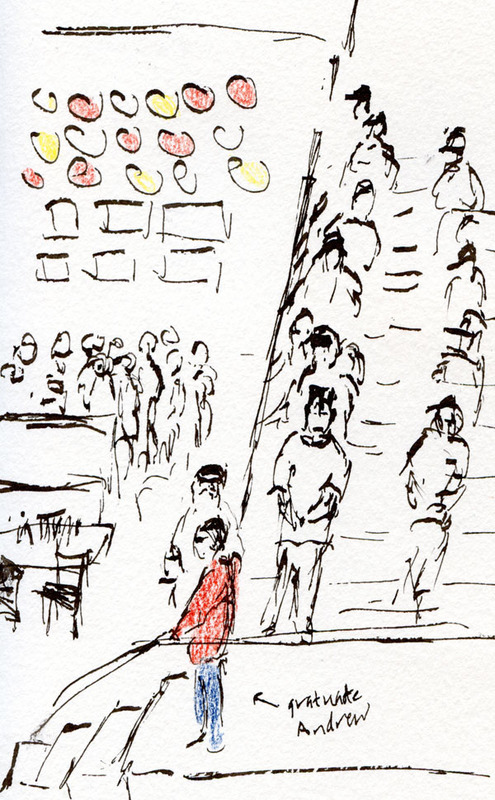 (His peers were all stacked up behind him on the stairway – an unusual and challenging perspective!) He talked about his personal struggles and how he almost gave up on the program, but now he feels confident that he can be successful doing whatever he chooses. 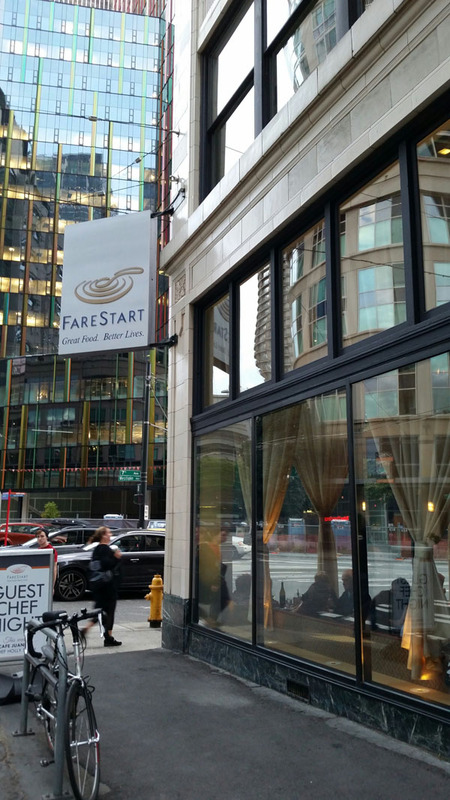 All proceeds from meals served at the FareStart restaurant go back into the program to support job training and placement. 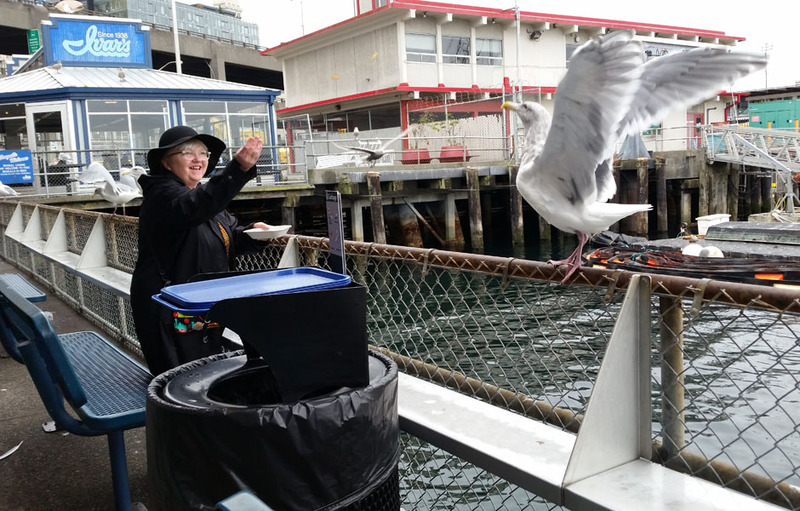 Of course we both saved some fries for the gulls! For about a mile between the Crown Hill and Ballard neighborhoods is a stretch on Eighth Avenue Northwest where the arterial is divided by a long row of trees. 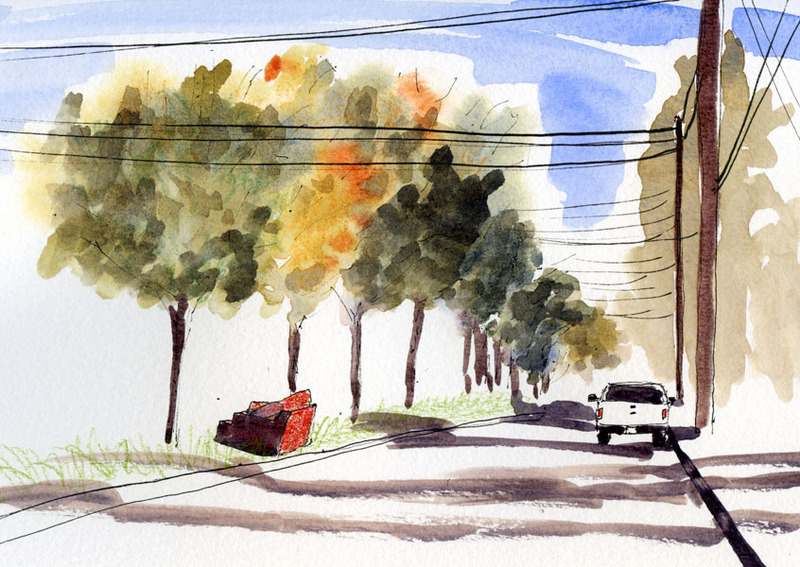 It’s one of my favorite streets to sketch in the fall (I sketched it in November last year). Since so many trees in my own ‘hood are already turning, I wondered if Eighth had turned yet. Bound for an appointment in Ballard this afternoon, I allowed a little extra time so that I could stop on the way for a sketch. 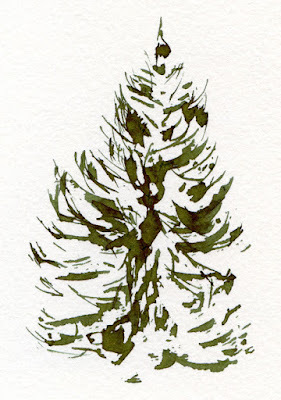 I was too early; most of the trees are still dark green. I did get an unexpected spot of color, though – an abandoned couch on the boulevard. At right is the traffic circle in the Greenwood neighborhood that is one of my favorites. 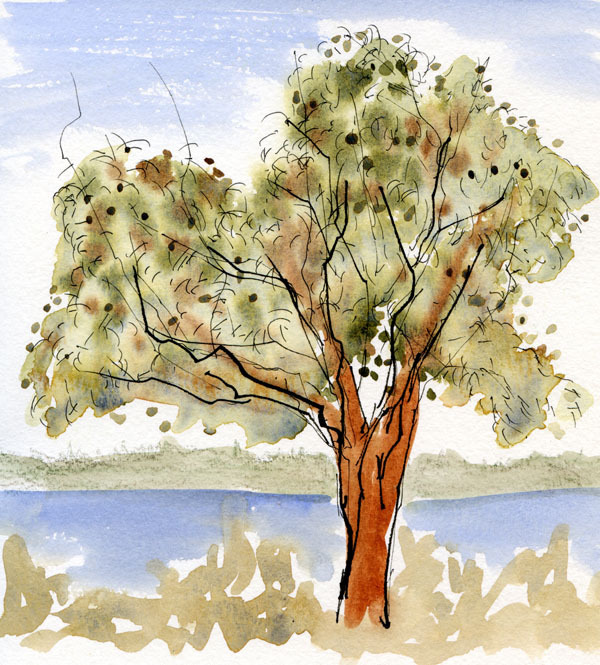 Instead of just one tree, it has three relatively slender maples growing in it. (Ironically, the trees are leafy enough that the yellow caution sign in the center is barely peeking through.) 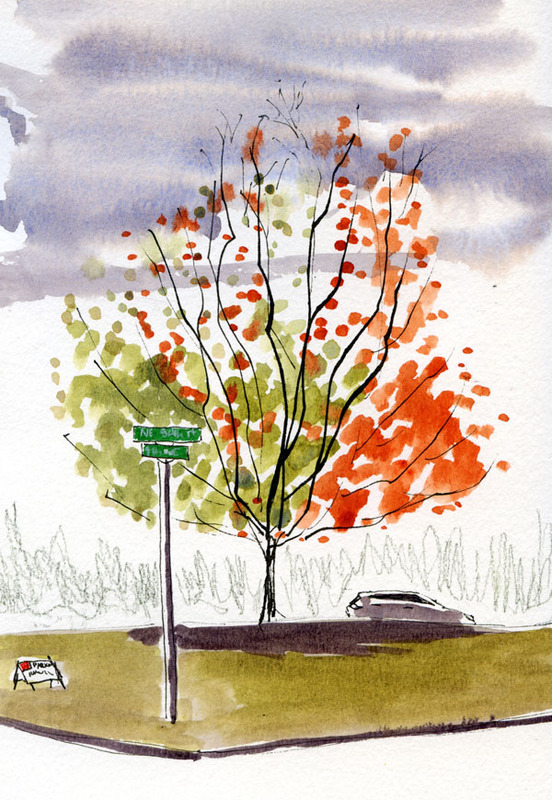 Last year at just about the same time, the tree on the northern side of the intersection was showing lots of color while the other two were still mostly green. 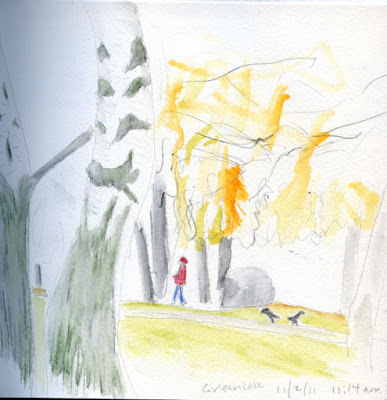 This time I sketched the circle from the opposite side, facing west, and found that the trees are following the same coloring pattern. Last year I intended to return later to see what it looked like when all three trees had turned, but I forgot. This time I made a note on my calendar to go back in a few weeks. A couple of miles due east in my own ‘hood is the traffic circle below. A dirty brush and some leftover yellow in my Cobalt made for a greenish streak in the sky that got worse when my tree bled into it. But I’m not that picky – color is color – and this is definitely the time of year for it. As a writer (commercial, creative and introspective) for most of my life, I know that writing teaches me not only about my subject matter but also about myself. The process of composing a sentence, an article or a poem requires understanding my own thoughts enough to arrange them into coherence. And sometimes (often) the actual process of writing is what clarifies the thinking that I thought I had already understood. As a result, I learn about myself. Four years ago today, I started drawing. I had tried many times in the past to learn to draw, but it wasn’t until I discovered urban sketching that the subject matter resonated strongly enough to keep me practicing. 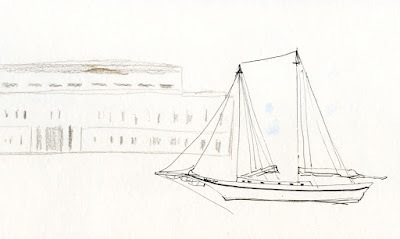 And the reason I wanted to learn to draw in the first place was that I already knew how to tell stories with words. I wanted to be able to tell stories with pictures. 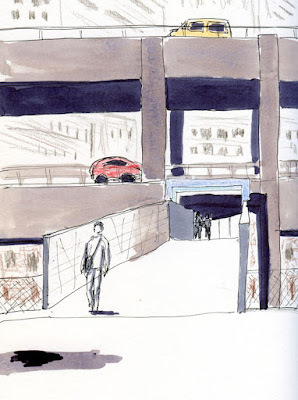 Urban sketching is the best way I know of to tell stories with pictures. I realize now that what I blurted out yesterday was, in fact, true. 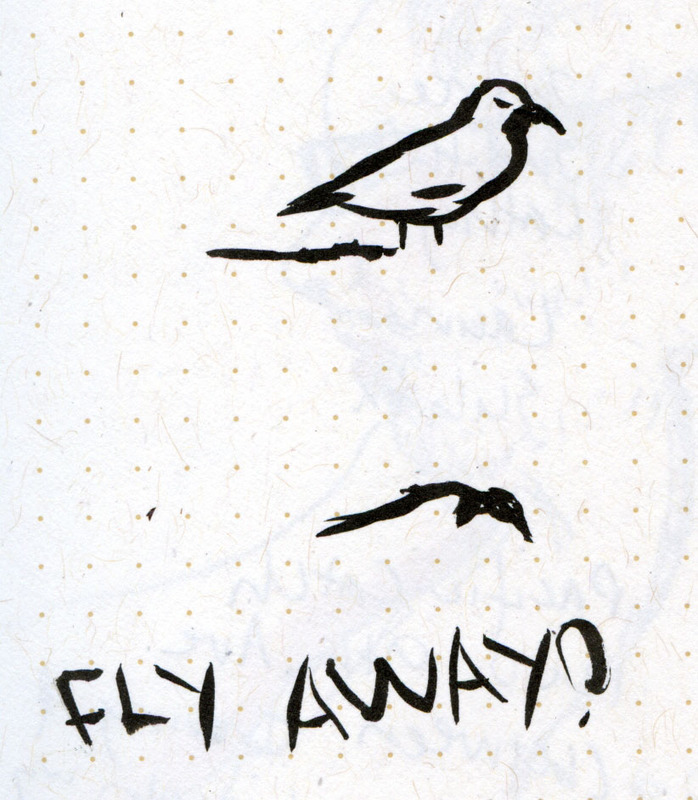 When I decide what to sketch, when I choose the medium that seems best for describing the subject, when I think about the “story” told by that sketch (as simple as that story might be), when I make the necessary intellectual and visual calculations to render the subject as accurately as I can, when I decide to forget all the calculations and instead just wing it – all of these choices teach me a bit more about drawing. And the act of drawing clarifies my own creative process just a bit more. 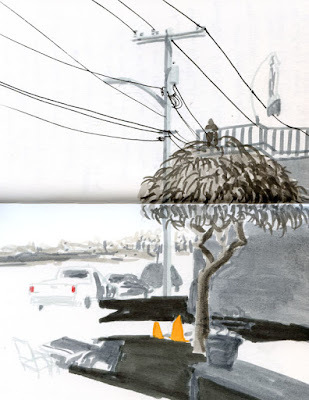 Urban sketching teaches me about myself. The Danny Woo Community Gardens in the International District offer a fascinating cross-section of urban Seattle. 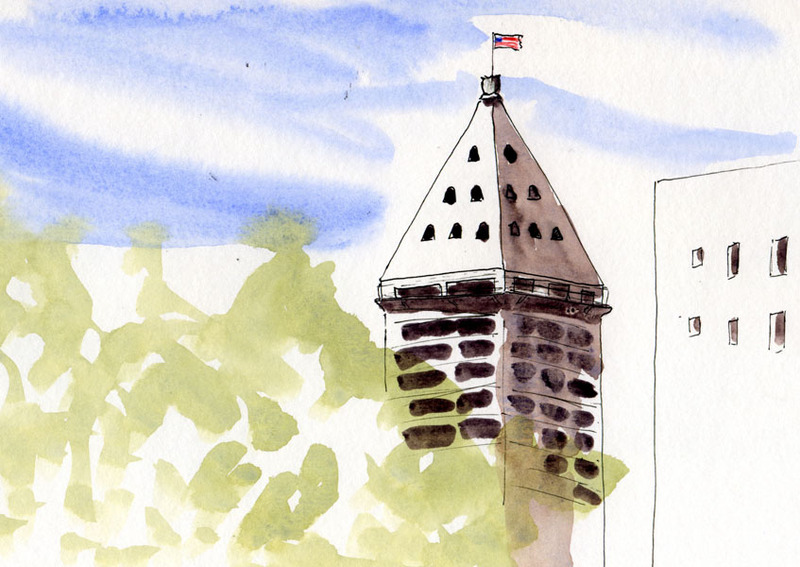 First there’s the interesting mix of architecture – new, boxy apartment buildings stand in the same line of sight as the stately Smith Tower. Scrappy-looking vegetation grows right next to tidy gardens and stands of trees that make you forget you are still in downtown Seattle. Gardeners weeding their P-patches look slightly askance at homeless men who, in turn, look askance at the sketchers occupying their favorite benches. 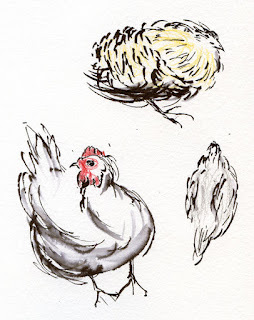 And then there are the chickens (which I sketched last year, too). It’s an ideal sketch outing location for Urban Sketchers Seattle because no matter what your subject interest – architecture, trees, plants, people, fowl – you can find it there. My favorite sketch of the morning is the one at the top of the page – the stone lantern (a 200-year-old gift from Seattle’s Japanese sister city, Kobe) marking tiny Kobe Terrace Park, which is your reward if you climb the gardens’ terraced hillside. A Japanese maple was just beginning to turn behind the lantern. Asleep nearby on the stone wall was a homeless man, covered in blankets. The last time I visited the Museum of Flight in March (and all the times prior to that, even on a Saturday), people were everywhere, but the facility is so huge that I never felt overwhelmed by the crowds. To celebrate its 50th birthday, the museum rolled its usual $20 admission price back to its 1965 ticket price: 50 cents! That – not to mention the fact that the Astronauts on the Town Instagram contest winner would be announced – brought in an astounding number of visitors. A huge line of people was waiting at the door when I arrived about 10 minutes before opening, and a line was still flowing down the walkway when I left a few hours later. Needless to say, the already-substantial challenge of sketching in the museum was compounded by crowds everywhere. 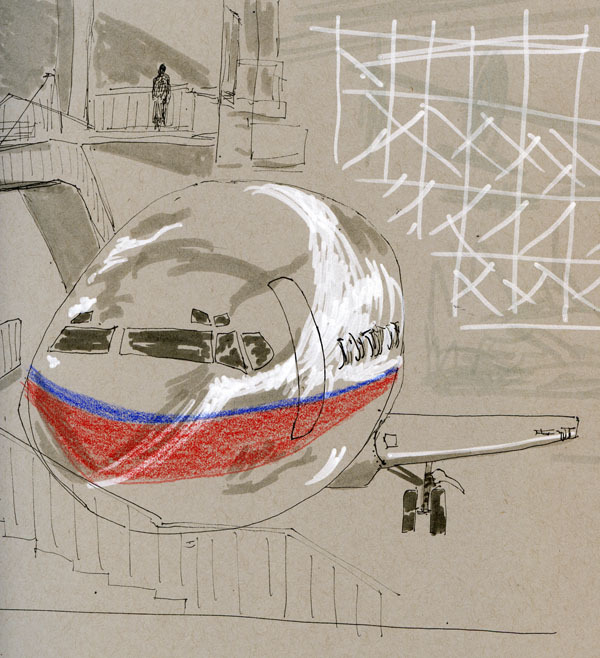 I went up to the third floor to sketch the Great Gallery, where all 25 Astronauts on the Town surrounded a couple of the aircraft on the floor. Dressed in '60s garb, Kate poses with her fave astronaut! Speaking of the Astronauts on the Town, while I got around to sketching only three of them (at Fran’s Chocolates, Salty’s on Alki and Third Place Books), Kate Buike sketched all 25! 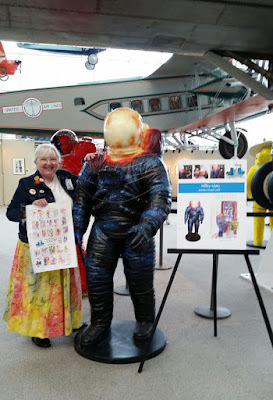 The Museum of Flight, where Kate is a volunteer, was so impressed that her sketches were used in the promotional placards about each astronaut. There’s no doubt about it – fall is here. 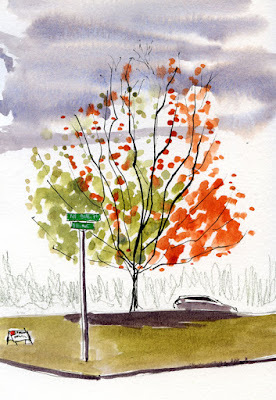 Yesterday we had a good, solid rainfall, the trees are all turning, and I’m wearing socks again. I decided to give the change in seasons my personal initiation ritual, which was to sketch at Zoka Coffee. It had been months since I’d sketched there, and even longer since I’d been to life drawing at Gage. To quickly get past that feeling of creakiness when I start drawing people again, I pulled out my new favorite toy: multi-colored pencils! You already know about the Koh-i-Noor Tri-tone colored pencils that I recently rediscovered. They are so much fun that when I saw some rainbow pencils on Amazon, I had to get a bunch of those, too. Seven colors are together in a single lead! I’m sure they’re intended for kids (the marketing information recommends them for party favors, Easter baskets and stocking stuffers), and I’m obviously the target audience – whenever I use them, I feel like a kid with a new box of crayons! 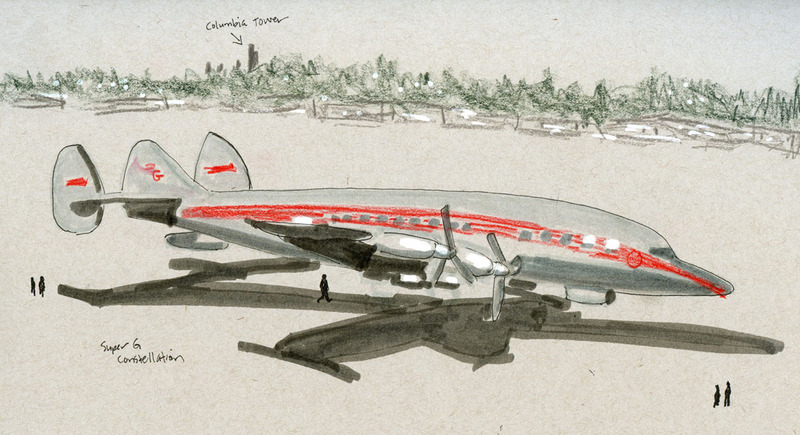 I’ve never been a fan of sketching with graphite, but colored pencils are something else entirely. 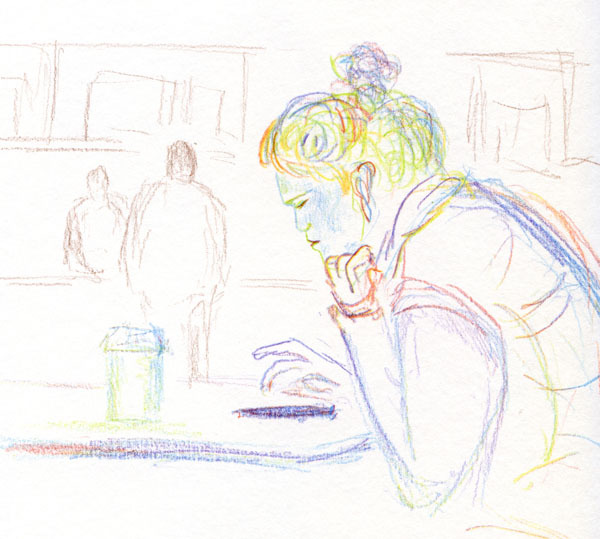 I wish the leads in these multi-colored pencils were a bit softer (I’m used to the delightful softness of my favorite water-soluble Caran d’Ache Museum pencils), which would make shading easier. But they more than make up for softness with the fun factor. 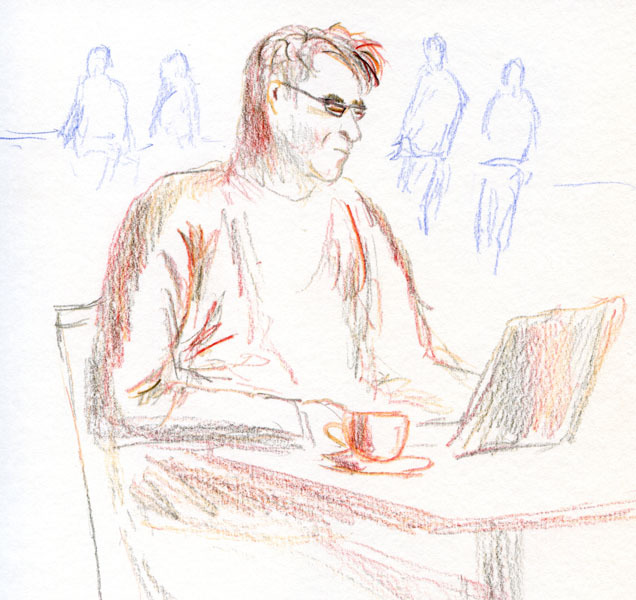 After a few sketches with these, I’d gotten over my creakiness, and I was ready for rainy-weather coffee shop sketching again (maybe I’ll even take these pencils to a life drawing session). At South Lake Union Park this morning, the sky looked iffy; the weather report had said rain was imminent. 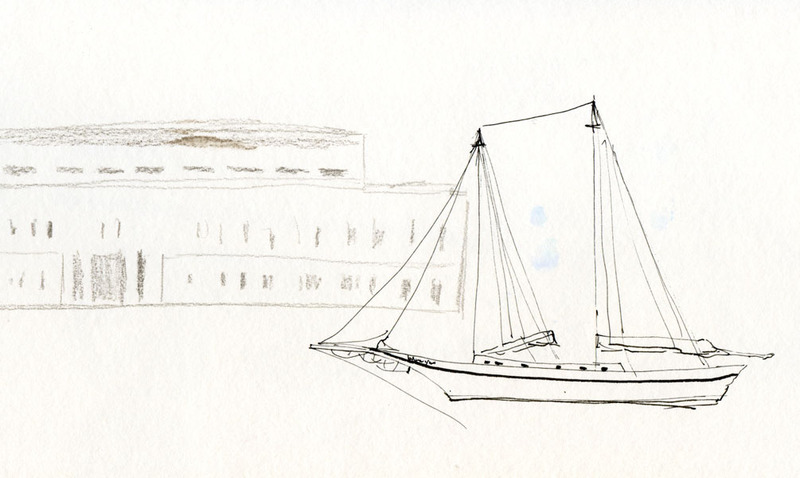 But on our way into the Museum of History and Industry, I spotted a lovely wooden schooner moored in front of the museum. 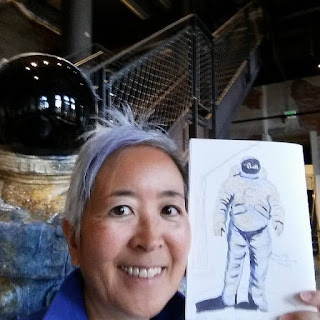 I told Greg and Mary to go on inside, and I’d catch up with them, because I had a feeling that if I waited until after we finished going through the exhibits, the weather would change, and I’d miss this sketch. I was wrong. It started raining after only a few minutes, so I missed only half the sketch. It got me thinking about all the parts and pieces of half-finished sketches in my sketchbooks over the years. Interrupted by rain, circumstance or, most likely, the subject walking (or flying) away, these are a few I found just from the last couple of months. A pity that they remain unfinished, but on the other hand, a half-finished sketch is still better than twiddling my thumbs. Check out the wide, flat nib on that Pilot Parallel pen! 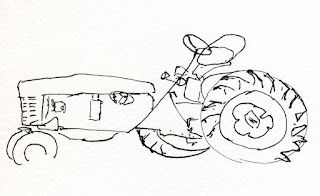 The Pilot Parallel fountain pen has been on my radar at various times. 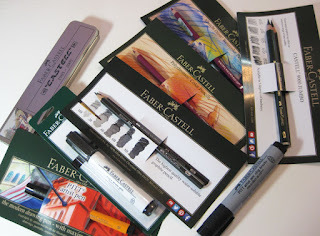 I have been curious about the very flat, straight-across nib that calligraphers use to achieve amazing effects (just Google “calligraphy with Pilot Parallel pen,” and you’ll see dozens of impressive videos and images), but I’m not a calligrapher, so I knew I wouldn’t use it for that purpose. More recently I started seeing examples of expressive drawings done with the pen (try Googling “sketching with Pilot Parallel pen”) that got me curious all over again. I found a good deal on a set of four nib sizes on Amazon (about $6 each), so I decided it was time to satisfy my curiosity. We were heading out this morning to show our visitor Kubota Garden, so I grabbed the 6mm size Pilot Parallel on my way out the door (that’s the largest size in the set; others are 1.5mm, 2.4mm and 3.8mm). 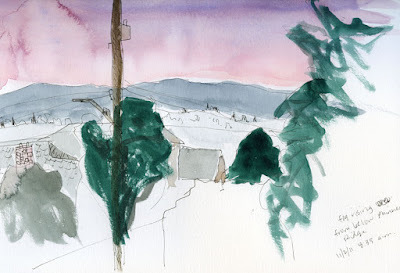 I’ve been resisting spending too much time sketching while playing host and tour guide, but I’ve sketched at this garden several times now (most recently with Urban Sketchers Seattle in June), so it was a little easier this time to resist the garden’s rugged yet serene beauty. 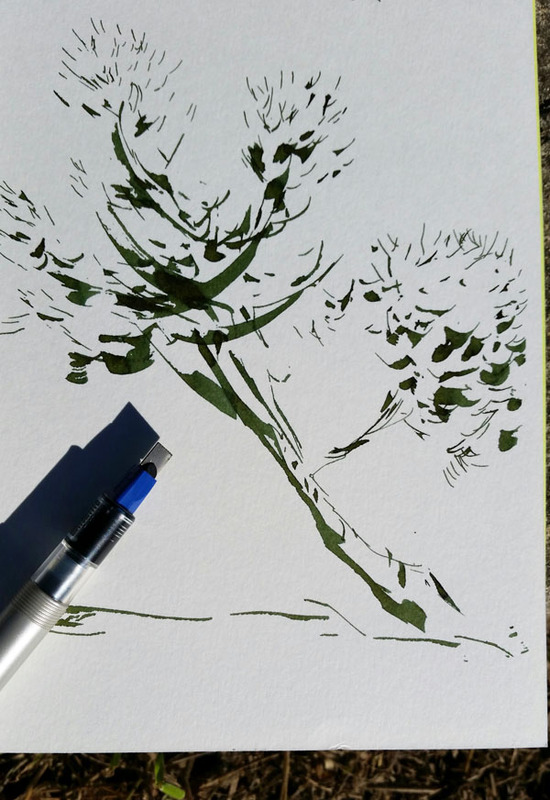 Still, I grabbed that Pilot Parallel for a reason: I had a hunch it would be a good implement for sketching trees quickly – and I was right! 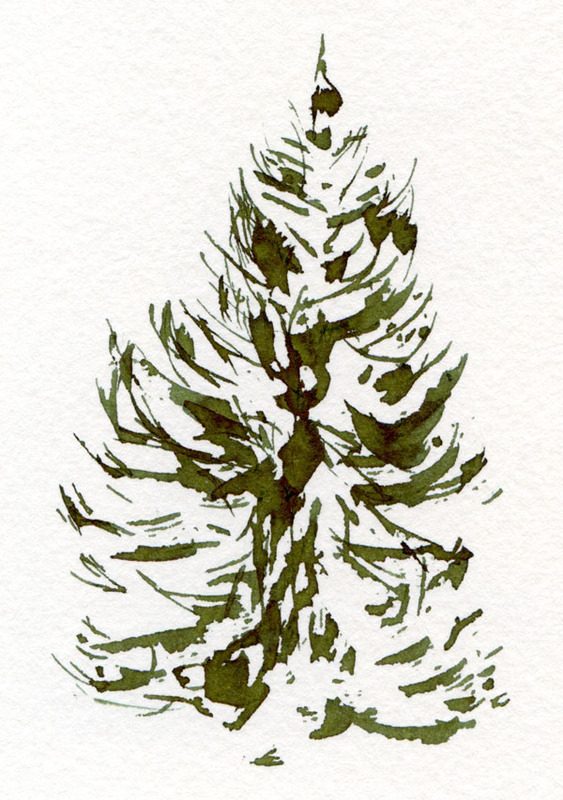 Taking only a couple of minutes each, I was able to scribble these studies of a pine, a fir and (incongruently!) a banana tree. The pen can make a very broad mark when pulled in one direction, yet can also make a very fine line. 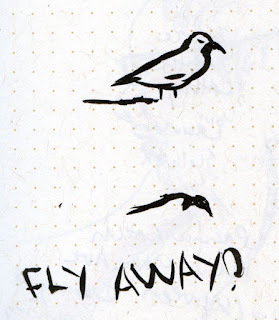 Although I’ve tried sketching with Lamy calligraphy nibs as well as the Platinum, Sailor and Franklin-Christoph music nibs (which aren’t technically calligraphy nibs but seem to behave like them), the 6mm Parallel nib is an extreme case. And I love it! These trees were only my first attempts, but I can clearly see the potential of the very interesting Pilot Parallel. I’ll write a full review after I’ve had a chance to mess around with the pens more, so consider this a teaser. “Star Stuff,” painted by Abigail Kinney Maxey, is inspired by a quotation by Carl Sagan. According to the artist’s statement, “Common living things, such as a dandelion plant, are celebrated in constellations to honor the existence of life in our vast universe. 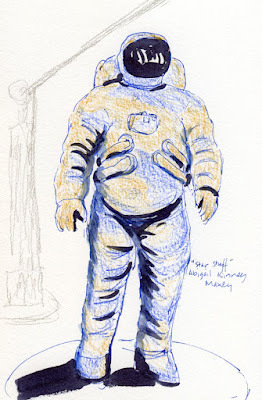 Design patterns bring to mind a starry night sky, bubbles in water, grains of sand, or single living cells.” I don’t know about the universe, but eating Chocolate Imperiales while chatting and coloring the astronaut’s suit is a delightful way to honor the existence of life here on earth. 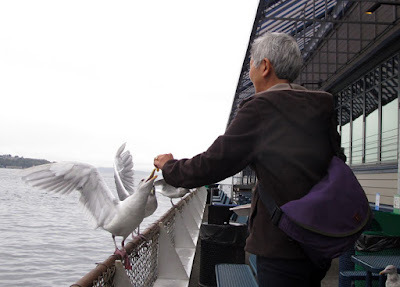 We took our visitor from out of town to Whidbey Island for the weekend. The clouds and cool temps kept most of the tourists away, so I felt like we had the island to ourselves. 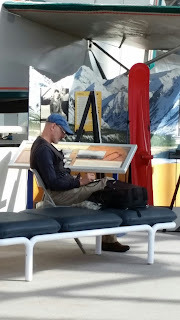 Relaxing on “island time,” we saw most of Whidbey’s scenic highlights: the Deception Pass bridge, Ebey’s Landing, the lighthouse at Fort Casey (which I sketched a couple of years ago) and beaches surrounding the island. The madrona tree, which did take longer than 10 minutes, was done while we relaxed on the deck of the house we rented in Greenbank. 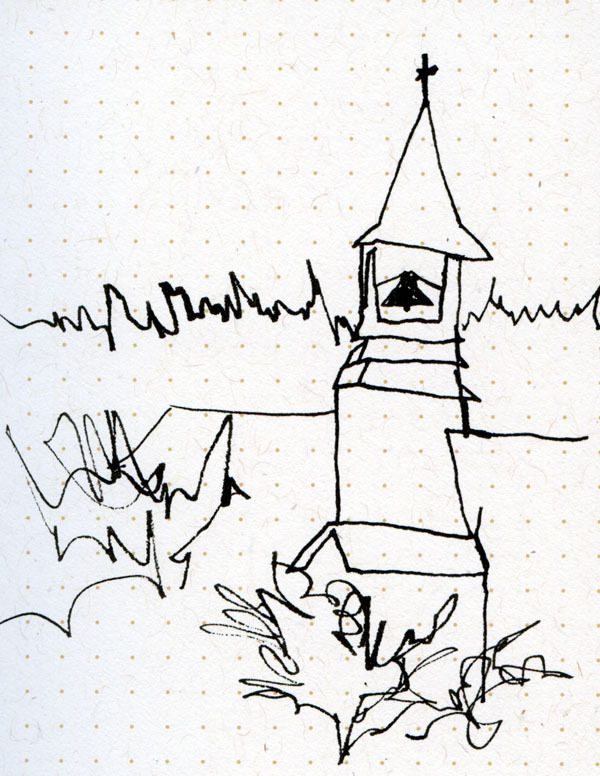 The Etch-a-Sketch-y church steeple in Langley is an example of a Marc Holmes single-line exercise, done in less than a minute! 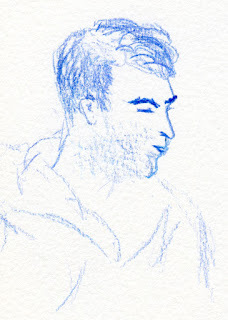 Marc says he can sketch with a single line in the same time that it takes to snap a photo, so I put myself to the same test with this technique. Greg had stopped to photograph something that had caught his eye, so I did the same – with my Field Notes notebook instead of my camera. Guess what? I finished sooner than he did! 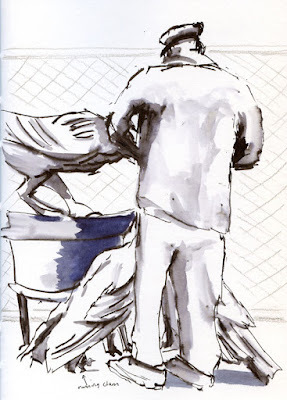 It’s not my most accurate sketch, but just as Marc said, even a sketch as quick and unfinished as this one still serves the purpose of capturing the visual memory in my mind. 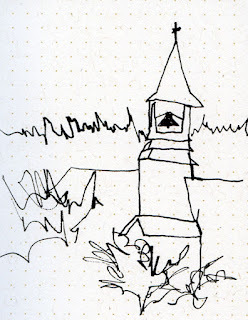 A year from now, while I won’t be able to recall many other architectural details from Langley, I bet I’ll still remember that church steeple. My most enjoyable sketch experience of the weekend was the series of tiny bird studies I made one morning while the others were still getting ready to go out for the day. 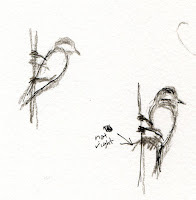 A couple of bird feeders hung outside the livingroom windows of the house we rented, and a flurry of small birds took turns getting their breakfasts. Chickadees have an amazing talent for wrapping their feet around thin vertical stems or wires, their bodies suspended at an angle. 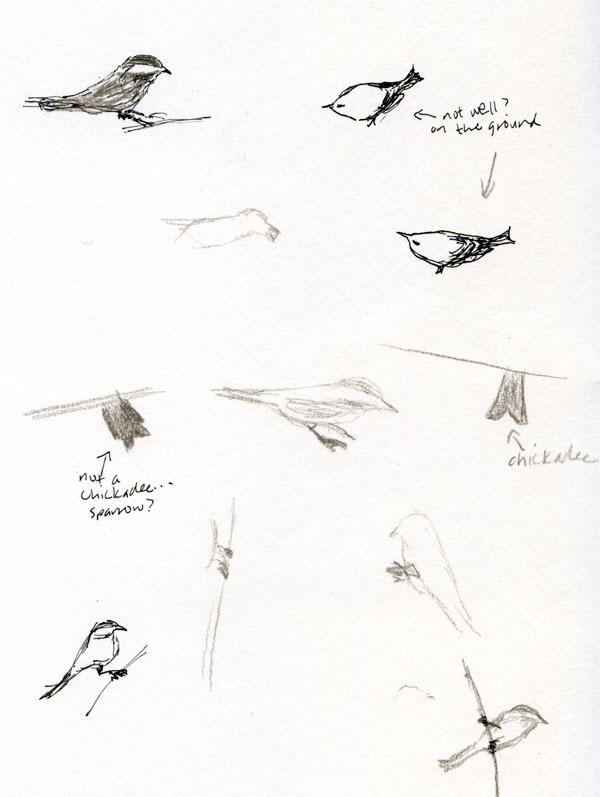 Making one small mark at a time before the chickadee flew off, then waiting for another to return to a similar position, I tried to capture that gesture. I didn’t quite get the position of the legs and feet right, but I had a ton of fun trying.